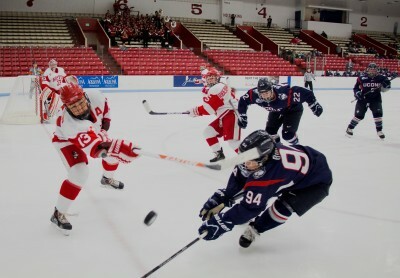 Northeastern’s womens hockey team scored three goals in the first period and BU could never recover, falling 7-1 at Matthews Arena on Saturday afternoon. It was the Huskies largest margin of victory over BU since 2004, when they won an 8-0 shutout. The game was far closer than the final score indicated. BU was outshot 39-31, but Northeastern (5-1-1, 1-0-0 WHEA) simply executed better, converting two goals in five power-play opportunities. This was their second straight game scoring seven goals, with seven different scorers. The Huskies rank third in the nation in scoring offense with 5.29 goals per game, scoring at least five goals all but two of their first seven games of the season. Terrier (3-4-0, 2-1-0) Coach Brian Durocher continued his game-to-game rotation of the two BU goalies, and junior Victoria Hanson struggled against an immensely talented Husky offense, giving up three goals in the first period alone. She finished with 24 saves in two periods of play, before being replaced by sophomore Erin O’Neill. “When we see a pattern we might make a change, rotating isn’t always the easiest thing for kids. But I’ve said from the beginning, I’m looking for one of them to make a statement and let me know that they’re going to be the #1 goalie,” said BU head coach Brian Durocher. NU freshman goalie Brittany Bugalski made a statement of her own, making 30 saves on the day. The Huskies started their scoring binge at 5:34 of the first period when forward Hayley Masters slipped in a rebound following Kendall Coyne’s attempt. Northeastern extended the lead with 3:04 remaining in the first period when forward Halle Silva scored her first goal of the season by using some impressive puck skills to nail a twisted-wrist rip past Hanson. NU made it 3-0 after converting a power-play opportunity with 1:44 remaining in the first stanza, coming from forward Paige Savage. The Terriers got their lone goal of the game at the 13:06 mark in the third period. It happened when senior Jordan Juron rebounded a shot from freshmen Mary Grace Kelley. It was Juron’s first goal of the season and Kelley’s first point. BU will look to put yesterday’s lopsided loss behind them and shift focus to improving their conference record to 3-1-0 Sunday afternoon when it hosts Vermont at 3 p.m.